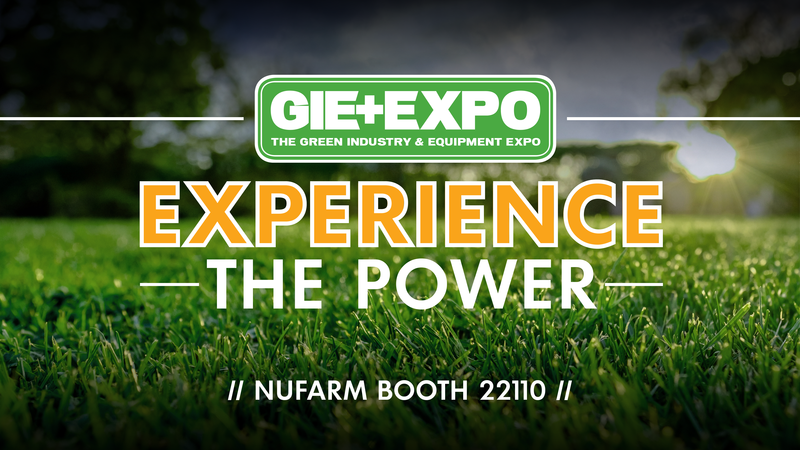 Raleigh, N.C. (September 18, 2018) – Nufarm announces plans for The Green Industry & Equipment Expo (GIE) that will highlight Sure Power Selective Herbicide, a new standard in weed control, that provides fast early-season and late-season control of more than 250 challenging broadleaf weeds. GIE attendees can visit Nufarm booth 22110 to tour a live display of wild violet take down and see superior trial performance. Enjoy an 11 am or 2 pm presentation, Thursday, October 18, from Nufarm expert Jason Fausey, PhD. Visitors can also join the Sure Power interactive training experience during all booth hours. The first 15 Sure Power training participants will receive a Nufarm “Power Pack,” including a solar-charged power bank. Attendees can alternatively earn the power prize (while supplies last) by registering for Nufarm Edge Rewards at the booth. The 2019 early order program offers the best line-up of herbicide, insecticide and fungicide product options to-date, including Sure Power. View eligible products and use the Nufarm Edge Rewards Calculator to review your savings potential at the booth. New and returning customers can use rewards to save on dozens of proven brands, including an effective end-to-end rotational program to attain cleaner, higher quality turfgrass all season long. GIE attendees can claim a gift for visiting Project Evergreen’s Green Care for Troops at booth 365 and visiting its sponsors, including Nufarm. GreenCare for Troops connects green industry professionals with opportunities to volunteer lawn and landscaping services to help deserving military families with a deployed service member. Liquid SureGuard® SC delivers the same long lasting residual control of grass and broadleaf weeds that you’ve come to expect from SureGuard in a new convenient liquid formulation. Also, SureGuard SC enhances the speed and spectrum of glyphosate when used as a tank mix partner, even on glyphosate resistant weeds. Celero® herbicide is a selective, post-emergence herbicide for control of sedges, including kyllinga in established residential and commercial turfgrass. The active ingredient in Celero translocates down to the roots to deliver superior sedge control in cool- and warm-season turf. Aloft insecticide delivers preventive and curative control to combat insects fast. Prevent troublesome turfgrass insects and surface-feeders – including white grubs – with a single early treatment or knock down existing pests with flexible application options from April to September. Plus, Aloft is EPA approved for fire ant control and is effective in attacking Red Imported Fire Ants. For a complete list of Nufarm professional turf and landscape products, visit www.nufarminsider.com. For specific application rates, directions, mixing instructions and precautions, read the product label. Please visit www.nufarm.com/us to download a full product label. ©2018 Nufarm.